RUNS – Bridges Outreach, Inc. 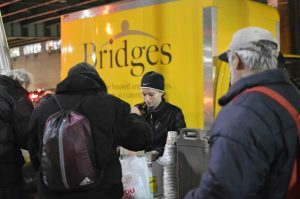 The Bridges Run is an opportunity for a group of trained volunteers, along with Bridges’ staff, to go directly to the streets and shelters to meet homeless men, women and children. On a typical Bridges Run, our truck is loaded with fresh, ready-to-eat meals in bags, sustainable lunches (long shelf life provisions), and soup, among other items of necessity, for those living on the street or in dire need. Our volunteers share conversation and bridge the gap between the housed and homeless. 1) If you are new to Bridges, please register your Group with Frank Damico, Operations Manager, at volunteer@bridgesoutreach.org. It may take up to 2 business days for your account to be ACTIVATED, at which time you may sign up for a Run. If you would like to join a Run as an individual, please contact Frank Damico at volunteer@bridgesoutreach.org. Please note: All run volunteers must be at least high school age. 2) Sign up for a Run. 3) Sign waiver. Each volunteer must sign the on-line waiver of liability form. 6) Download directions. Please note that the GPS links are through Google Maps. Other map applications, such as Apple Maps, may not display correctly. Manhattan: Penn Station – Wednesdays, Leave Summit at 6:00 p.m. arrive at site at 7-7:30. Back at Summit at 8:30-9. Manhattan: Collect Pond Park and Staten Island Ferry Terminal – Fridays Leave Summit at 6:00 p.m. arrive at first site at 7-7:30. Arrive at second site at 8-8:15. Back at Summit at 9:30-10. Irvington: Civic Square – Sundays, Leave Summit at 10:00 arrive at site at 10:15-10:30. Back at Summit at 12:30-1. Core Volunteers make a commitment to participate in a Bridges Run at least once a month. They are the first to arrive at a Run site and talk to the people waiting there. They reassure the waiting people that the Bridges truck and a team of volunteers will arrive shortly with food and necessities. The Core Volunteers have become an integral part of our Runs and have truly become friends with the homeless people we meet. They provide continuity and have time to continue their conversations from week to week. Core volunteers are not required to bring brown bag meals. They sometimes ride in the Bridges van, but may be asked to provide their own transportation to Run sites. Contact the Manager of Operations at volunteer@bridgesoutreach.org if you would like to learn more about becoming a Core Volunteer. A Group of volunteers (houses of worship, corporations, families, neighbors or teams) makes a commitment to participate in a Run of their choice. They sign up in advance and are responsible for providing volunteers and brown bag lunches. Please see Plan Your Run for more information. Individual volunteers may join a Run when space permits. As a volunteer, you will be asked to assist the Run Coordinator with various aspects of a Run, from distributing food and clothing to serving soup and beverages. You may be asked to provide some lunches or your own transportation. All Run volunteers must be at least high school age. As always, friendly conversation with our homeless friends is encouraged; fellowship is as important as the food and necessities we distribute.